Diabetes is a disease, which affects the small blood vessels of all the organs of the body. As the disease progresses it inevitably involves the microvascular architecture i.e. the blood supply of the retina (sensory part of the eye) also. 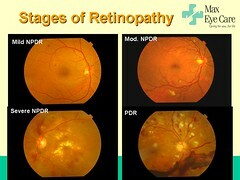 This manifestation of diabetes is called as diabetic retinopathy. To simplify – It is a disease of the blood vessels of the retina due to diabetes. What causes it & Who are at risk? The main cause is long standing diabetes. Among younger-onset patients with diabetes, upto 8% of individuals will have this disease after 3 years of diagnosis and 25% at 5 years, 60% at 10 years, and 80% of diabetics will have this eye problem by 15 years. In older type 2 diabetics up to 21% of patients have diabetic retinopathy at the time of first diagnosis of diabetes, and most develop some degree of retinopathy over time. Uncontrolled diabetes , High blood pressure, High cholesterol, Kidney disease and Low Haemoglobin worsen diabetic retinopathy. It may be asymptomatic for a long time. Once the macula , i.e. the central part of the retina develops swelling , there would be a deterioration in eyesight. If there is bleeding within and in front of the retina, floaters would be seen or the vision may be drastically reduced. Floaters is seeing black spots or lines moving in front of the eye. Once the central retina is detached the vision loss becomes severe and chances of recovery even after surgery become less. It can be diagnosed by a simple dilated eye examination to see the retina in detail. If significant changes are found then investigations like Fluorescein Angiography and Optical Coherence Tomography may be done. Fluorescein Angiography involves taking photographs of the retina after injecting a dye in a vein in the patient’s arm. The dye reaching the eye helps to clarify the type and extent of disease, including detail of abnormal vessels and leakage. Optical Coherence Tomography : In this test photographs of the retina are taken to show its microscopic detail. So it can help detect any early thickening of the retina in areas of leakage. The type and amount of thickening can be delineated and an assessment of any pull on the retina can also be made. It is an excellent tool to follow up after treatment to assess the effect of the treatment done and need for re-treatment. The gold standard of therapy is LASER photocoagulation. Other options now available are injecting drugs like steroids and AVASTIN into the eye. These drugs also aim to reduce the swelling in the retina and help in drying up of the abnormal blood vessels. These are quite effective and can even improve vision in some cases. A major drawback is the effect of these drugs is time limited and many patients require re-injections. Combination therapy of LASER and injections is also being done. Advanced cases with non-resolving bleed in the eye or retinal detachment require advanced microsurgery. This involves highly complex Vitreo-Retinal surgical procedures. Today with highly advanced technology, some amount of visual recovery can be achieved in a large number of advanced cases also. Cases which present early and are adequately lasered generally maintain good vision. A good control of diabetes is most important to slow the progression of disease. A combination of injectable drugs and laser has improved the outcome in moderately advanced cases also. 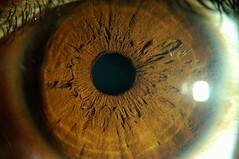 The outcome may not be very good in advanced cases even after surgery, however still some useful vision can be retained. Complications of diabetic retinopathy are non resolving swelling of the retina, bleeding into the eye and detachment of the retina. Complications of LASER are minimal. In some cases the swelling of the retina might increase initially, but this also normalizes in most patients. Complications of AVASTIN per se are also minimal , but the main risk is of infection during the injection procedure. To prevent infection we routinely perform the injection in our operation theatre , taking all aseptic precautions. Complications of steroid injection can again be infection, rise in eye pressure (glaucoma) and cataract. Complications of surgery can be repeat bleeding into the eye or damage to the retina. 1) Tight blood sugar control . Maintain Glycosylated haemoglobin (HBA1C) < 7%. This test reflects the sugar control over the past 3 months. 3) Rule out loss of protein in urine ( microalbuminuria) and treat kidney disease as far as possible.